"Enemies of the heir ... beware!" The latest Harry Potter film came out over the weekend, and even though it’s an unofficial fan film, its exploration of Tom Riddle’s dark personal history is downright magical, offering a villain’s origin story that more than competes with Grindelwald’s emerging tale in the Fantastic Beasts movies. 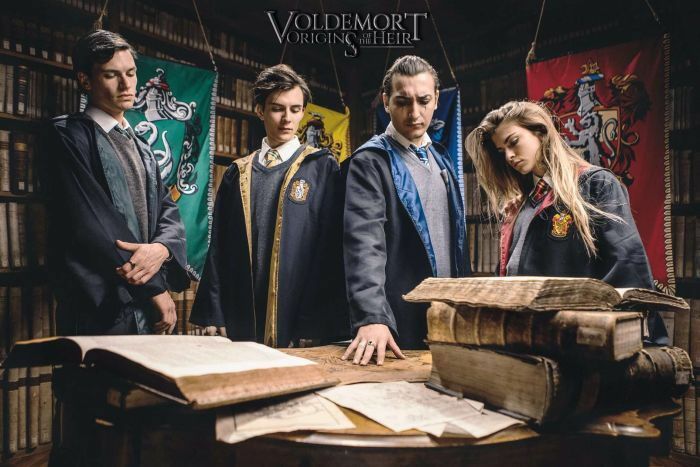 Directed by Gianmaria Pezzato and produced by Tryangle Films, Voldemort: Origins of the Heir follows Tom Riddle (Stefano Rossi) in his adult years before rising to power as Lord Voldemort. Origins of the Heir borrows heavily from Voldemort’s canonical origins — offering quite a bit of fan service along the way — to ultimately tell a non-canonical story full of new characters. The story includes numerous flashbacks to Tom Riddle’s Hogwarts years and mostly follows Grisha McLaggen, a Griffyndor heir searching for Riddle after the murder of Hepzibah Smith. Predictably, there’s some heavy focus on Tom Riddle accruing the objects he would eventually turn into Horcruxes, especially the diary, Salazar Slytherin’s locket, Helga Hufflepuff’s cup (which was why he murdered Smith), and Rowena Ravenclaw’s diadem. You should recognize the locket immediately. The film comes in at 52:40, barely longer than a television episode, but the storytelling and production value are top-notch, with the magical fight sequences on par with almost everything we’ve seen from Potter films to date. The costuming, both during and after Riddle’s Hogwarts years, is fantastic — realistic and practical while still having a touch of the strange you see in all Wizarding World garb. Yes, we get to see the classic Hogwarts costumes, too. If you’re wondering how Tryangle can get away with making this, the project was funded on Kickstarter in 2016 before the director made a deal with Warner Bros. to release it not-for-profit. If there’s one thing to complain about, it’s the audio. The film was shot entirely in Italy and presumably filmed in Italian, so at least for English-speaking viewers, the disconnect between the audio dubs and the actors’ lip movements can get distracting. Especially for those anxiously awaiting the next Fantastic Beasts film in November — which will explore the history of the dark wizard Grindelwald — Origins of the Heir offers up a magical story most Potterheads can appreciate. For the full thing, watch Voldemort: Origins of the Heir over on YouTube, where it currently has more than 7.9 million views.